Summary: ﻿Humans and androids crowd the raucous streets of New Beijing. A deadly plague ravages the population. From space, a ruthless lunar people watch, waiting to make their move. No one knows that Earth’s fate hinges on one girl. . . . So, as you can probably guess by the title, this is a fairy-tale retelling, but i can guarantee you it is like no other. Cinder our protagonist is part cyborg, from the far future’s New Beijing. Enter the prince, the love interest, and of course you are going to get the built up love story, lies, and in typical Cinderella fashion, the escape. With death, mechanics and the opposing “Moon Kingdom” with their alien powers this book is a sure fire way to start the series off with a bang! In many ways, I am surprised at the well, lack of pick up for this book. It has all the elements a good story needs, action, love and a fight for freedom. It also fits into many genres, which you would imagine, would get a lot of people reading. In my view, this is equal if not better than “The Hunger Games”! As for the build up of Characters, Meyer has fleshed out Cinder and her sisters, along with her robot friend with fresh inviting personalities, that make you want to root for Cinder and kick one of her sister’s behind. Her Robot companion is both sweet and funny adding that “fun” element you need in a serious story. Prince Kai on the other hand was if slightly lacking, although you learned of his plights and problems as the book continues you feel an empathy with him, and overall hope Kai and Cinder get together. The Book, a first in a series can get a little confusing in places as various plot lines build and each character gets their story, and as more and more of their past lives are revealed the more you feel, a second reading would help (and it really does). Although saying that i read this book in one sitting and was pleased with where Meyer left it, to continue onto the next book. Spaceships and all. Overall, this is a must-buy book. 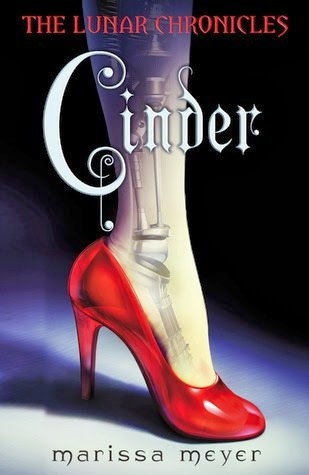 it is exciting, fresh and a great new interpretation of the Cinderella fairy-tale, and with all the sequels adding in a new fairy-tale, this is a series to watch out for!